While many retail nurseries offer what we call "Freeway Trees", not really appropriate for home owners, we focus on trees that are gentle and have positive features to contribute to your garden, not intrusive in their growth, neat (do not make a mess), and certainly will not destroy your pluming, nor get inside your swimming pool. During installation, we make sure all planting of trees is optimal, your landscape is ideal, not just for you, but also for your adjacent neighbors. Freeway trees such as Eucalyptus or Pepper trees while they look attractive inside small containers at nurseries, most homeowners don't realize the amount of "mess" produced once such trees are mature. People tell us it was hard to know because they drive by them at high speed. Roots can get quite large and destructive too! Several years ago, the neighbors behind me placed a eucalyptus tree that was 10 foot tall at the time, 20 inches from our property line. I immediately asked them to relocate the tree, but they refused, saying they'd keep it trimmed (they haven't). Years have passed. We've dealt with and been distracted by the massive amount of mess the thing makes in our yard and have concentrated on cleaning it up. The tree is now between 50 - 60 feet tall. There is a crack which runs vertically (down the wall) of our swimming pool. Coming out of the crack, just below the pool water line, are little fingers of tree roots. The tree sits about 20 inches higher than where the roots are coming out of my pool. There is a planter bed/retaining wall between the tree, a narrow pool deck walk, and finally, the pool wall. 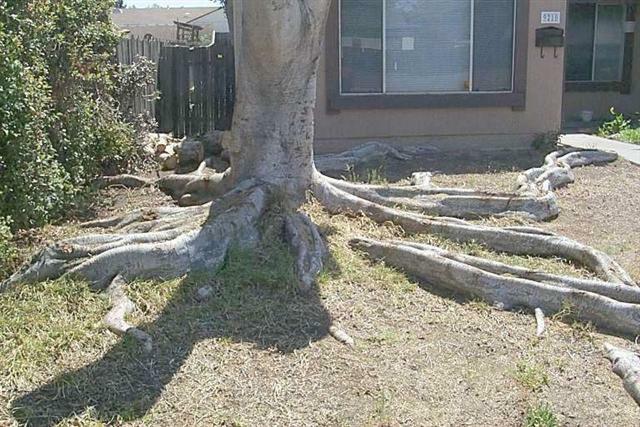 The total distance between where the tree sits and where the roots come out of the pool is 6 feet, 8 inches. We have done some digging in the planter bed in the immediate area where the crack in the pool wall/roots are. There is a pretty serious root cluster with about 8 shoots of roots ranging in diameter between 3 and 6 inches. One of these shoots is sort of a double in that there are two distinct roots, but they are sort of bound together. This is the root that appears to be growing directly into the concrete. Can a tree root crack concrete/a pool wall? Thank you Kevin for sharing your story. It is unfortunate, now is a good time to remove this tree. The mess and problems are not only at your yard, but certainly at the neighbor yard too. There are many alternative shade trees, privacy hedges offered on Adam Tropics website which will improve the overall landscape, bring both you and your neighbor real "peace of mind". We are happy to make specific recommendations, no charge for landscape design for all of our valued customers.